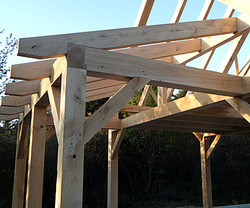 Rehouse Timberframes and Green Building is committed to environmentally responsible construction, focusing on salvaged, local & recyclable building materials. Rehouse is proud to be the recipient of the 2011 Business Excellence Green Award. Chris Bird is the brains and brawn behind rehouse. 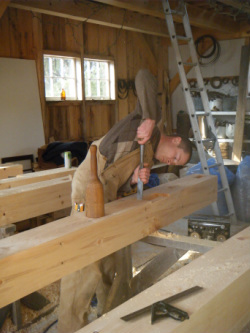 A modern languages major, Chris left behind the world of academics and writing to pursue the art of timberframing. After short stints reporting local news in upstate Vermont, protecting a coastal wildlife preserve in mid-Coast Maine, and dabbling in the art of landscaping Chris jumped in his 22 year-old Saab in February 2004 to drive across the cold wintry country to make his way to Northern B.C. to enroll as a Carpentry student. There he learned the basics, excelling in every part of the carpentry trade, he graduated top of his class, and left with the passion and motivation to build beautiful timberframes. The day he graduated he got offered a job as a timberframer all the way across the country in Nova Scotia. In Nova Scotia he dove into every aspect of the building process, working on cutting, prefitting and on-site assembling and in the office marketing. 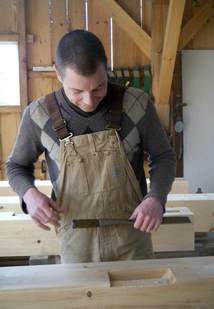 Chris is unbelievably dedicated to the art of timberframes. He will work with you, encouraging, teaching, and supporting you in building the perfect place. Chris will answer any and all questions or concerns you might have.